We continue our in-depth look at all of the cards coming to Hearthstone's "Whispers of the Old Gods" expansion, with reviews of another week's worth of cards. Hearthstone next big expansion, Whispers of the Old Gods, will be wrapping its tendrils around the community in about a month. There's plenty to be revealed in the meantime, though. To keep pace leading up to the launch, we're taking a fresh look at all the new card reveals every Friday. With the Old Gods encouraging deck-builders to create decks centered around their unique effects, it only makes sense that a card would exist to make sure you draw them. 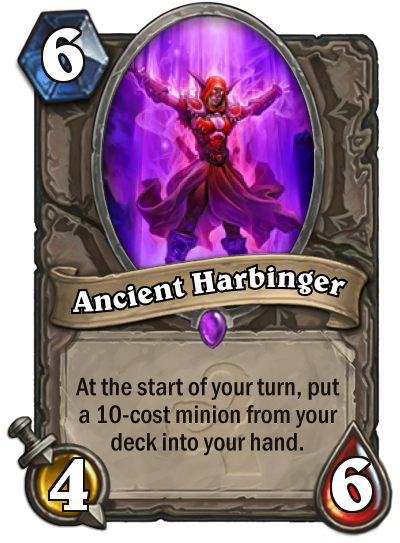 Ancient Harbinger is just such a solution, seeing as the Old Gods are 10 mana apiece. Chances are you'll only pack one Old God in a deck, which essentially means this card is explicitly included to draw one specific card, which also happens to be your win condition. So, is an extremely specialized card draw worth two points in lost stats? Absolutely, if you can manage to get it to activate. The struggle with Harbinger will be keeping it on the board. By turn six, your opponent is likely to have some minions around to kill it, and at only four attack it probably won't trade evenly. That means it may be best to save this card for a moment that you have strong board control with some protection around, or else you're just playing bad vanilla stats with no benefit. Spell: Add 3 random Mage spells to your hand. As Reno Jackson pushes the Hearthstone meta-game into a slower Control-based meta, it's important for each class to keep up with options to last into the late game. Mage relies on spells to keep pace, but many of them are combos, which means they might be trading two cards to deal with one of an opponent's cards. 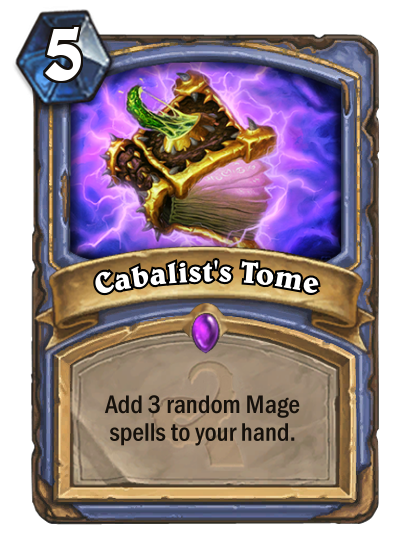 All of that makes the Cabalist's Tome, which basically gives you a 32-card deck, incredibly valuable. It should allow Mages to continue finding tools well into the late-game. What's more, it synergizes well with a lot of other Mage cards, like Flamewaker and Archmage Antonidas. It does come with the slight drawback that you're trading a spot in your deck that could be a specific spell for three random ones, but on the whole that's still a great value. Battlecry: For each enemy minion, restore 2 Health to your Hero. Those with faith in Blizzard's wisdom trusted that the introduction of a new Standard format meant we'd see some similar tools to replace the ones we're losing. 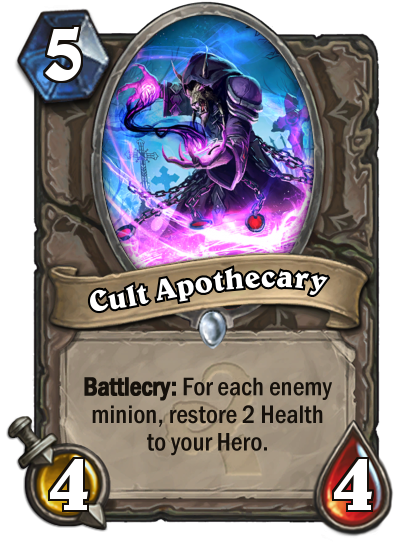 As we prepare to say a fond farewell to Antique Healbot in the rotation, Cult Apothecary is a very comparable minion. A 5-mana body with relatively weak stats with strong healing. Cult Apothecary is a little less certain than Healbot, though. The 4/4 body is heartier, but the effect means you'll need to be facing at least 4 minions to achieve the same healing effect. With that many bodies on the board, chances are your opponent can trade two or three to kill the Apothecary and still have some left over to continue bashing your face. That makes this a very situational tool, especially if combined with Bran Bronzebeard. As an emergency bandage to halt the bleeding while you wait another turn for Reno Jackson to crush your aggro opponent's hopes and dreams, though, it fits the bill. Spell: Give your minions "Deathrattle: Add a random Beast to your hand." And on the subject of replacing cards that are retiring from Standard, we have this lovely spell. No more Webspinners? Fine, we'll make our own! 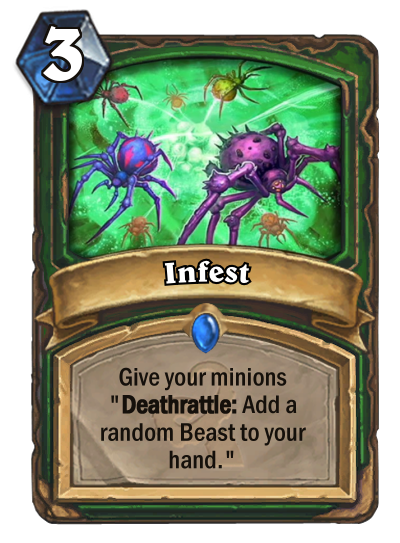 Infest is bound to be a no-brainer inclusion for aggressive Face Hunter decks, especially since one of the major weaknesses is running out of steam. This way you can fill your board and cast a low-cost spell to refill your hand. Even if you only have three minions on the board, it's comparable to drawing three cards. The random effect makes it less predictable than card draw, but as a trade-off, you still have the rest of your deck and you aren't pushing toward fatigue. This stands a good chance at giving Hunters a smoother curve, allowing them to push damage early and then segue smoothly into the mid- and late game. Plus it has combo synergy with Unleash the Hounds and Feign Death. Spell: Give a minion +2/+2. If it's a Beast, draw a card. Blizzard has been pushing the Druid class toward Beast synergy more and more lately, and this spell is a push in that direction as well. Here we have a card that is well-priced for its effect, but only if Beasts become more of a Druid staple. Two mana for 2/2 in stats is nothing special, and requiring a body on the board makes it weaker. Combined with the card draw, which generally averages at around 1.5 mana, makes it much more valuable. But not only do you need to have board presence, that board presence needs to be part of a specific tribe. This card is an auto-include for Beast decks, but whether such decks are viable for competitive Hearthstone play remains to be seen. 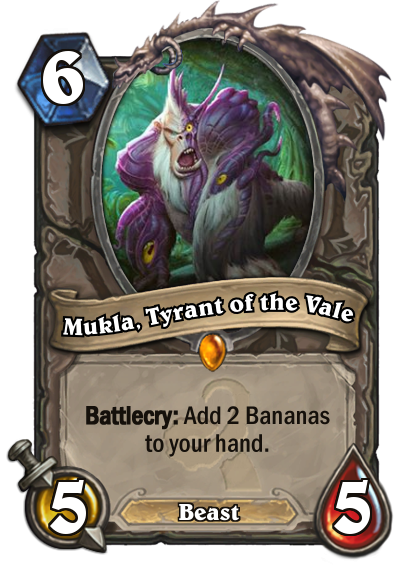 Another twist on known card, this version of Mukla offers identical stats but a new price based on the benefit to you rather than your opponent. Paying six mana for a 5/5 is a bad deal without a powerful effect, but it's not entirely unheard of. See: Sylvanas, Emperor Thaurissan. So are two bananas comparable to those effects? The short answer is no. Sylvanas is a strong card because it can steal very powerful minions from your opponents, which both strengthens your position and weakens theirs simultaneously. Thaurissan gives you at least one discount, so any more than two cards in your hand means you'll get more mana value than this version of Mukla. All that said, he could find a home in decks that rely on minions that benefit from buffs like Dragonkin Sorcerer or Djinni of Zephyrs. Or, his bananas could serve as fuel for Archmage Antonidas in Mage decks, now that the Spare Parts from Goblins vs Gnomes are going out of rotation. At the end of your turn, restore 8 Health to a damaged friendly character. Hearthstone pros tend to agree that the Paladin's first Legendary, Tirion Fordring, is among the most powerful class Legendaries. As a result, Blizzard has seemed content to release other Legendary cards for Paladin that have interesting effects, but aren't very effective or useful. 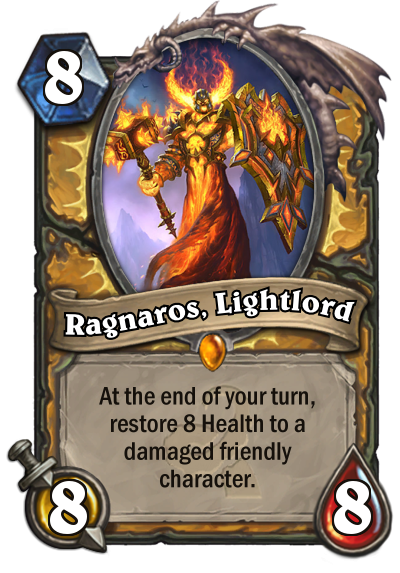 Ragnaros, Lightlord looks to be the next in this proud tradition. Granted, healing 8 Health is a big effect, and any damaged friendly character means he could self-heal. It's similar to Antique Healbot's benefit, but with much bigger stats and the possibility of healing several times throughout a match. Plus, unlike the original Ragnaros, it can actually attack. But, eight mana is a lot to spend, Big Game Hunter makes it vulnerable, and Paladin already has plenty of other healing options. It's hard to see using a card on Ragnaros. At the start of your turn, double this minion's attack. This is a very unique card design that may just be slightly too slow for competitive play. 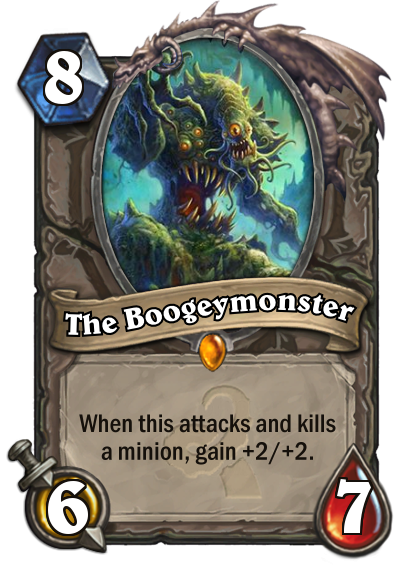 With such high health, chances are it will at least survive one turn to become a 4/8, which is decent stats for the cost. If it survives two turns, it becomes a whopping 8/8 for a relative steal. But, waiting two turns for that to happen puts it at a severe disadvantage. It could conceivably find a home in a Dragon Priest deck, which has plenty of taunts to hide behind and can heal it up regularly so it achieves its full potential. Outside of that possibility, it's hard to see a proper home for the Scaled Nightmare, despite its neat design. 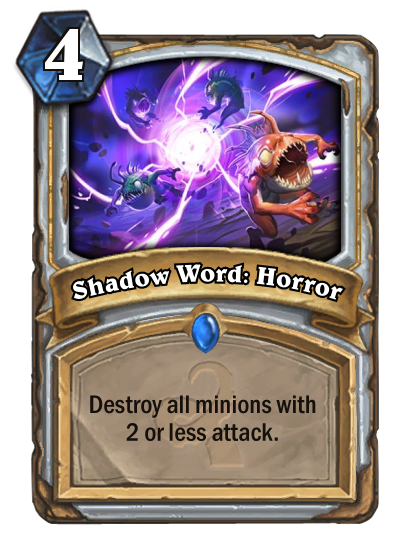 It's been a while since the Priest has gotten a new Shadow Word, and this one packs a pretty big punch. Aggressive decks already struggle to overcome the Priest's various control options and healing power, and this gives yet another tool to fend off Face Hunters and Zoo Warlocks. If a Priest is getting overwhelmed by turn four, it can take care of the entire enemy board in one fell swoop. Paired with Volcanic Drake, you could clear the board and put down a 6/4 minion. But, this may be a solution to a solved problem. Reno Jackson has chased more aggressive decks out of the meta-game. It could be worth packing one in a deck to keep board control, or to pair with Shrinkmeister in Wild formats, but not a real necessity unless the game speeds back up significantly. Deathrattle: Give your minions +1/+1. In every set, some cards aren't particularly great or horrible. They help introduce some new cards to the game with decent effects, and Spawn of N'Zoth is one of those cards. It's cost is high for the stats, but it has a powerful effect if you have a full board. Like all Deathrattle buffs, though, it's easy enough for your opponent to play around by simply targeting it last. 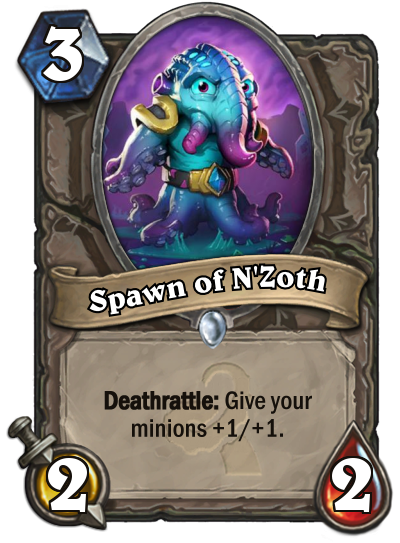 We could see Spawn of N'Zoth played alongside N'Zoth itself, since it would get revived with a presumably full board. 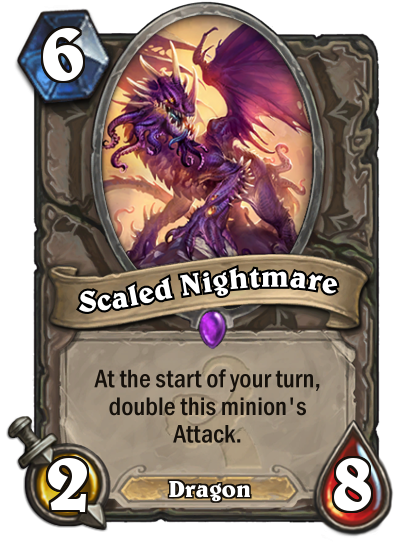 It could also find a home in aggressive zoo-style decks with lots of minions, especially if it can be given a taunt to force your opponent to deal with it first. It's a fine, if unspectacular, addition. Whenever you summon a 1-Health minion, give it Divine Shield. Thanks to healing options and Tirion Fordring, Paladin tends to lend itself toward heavy control options that push into the late-game. 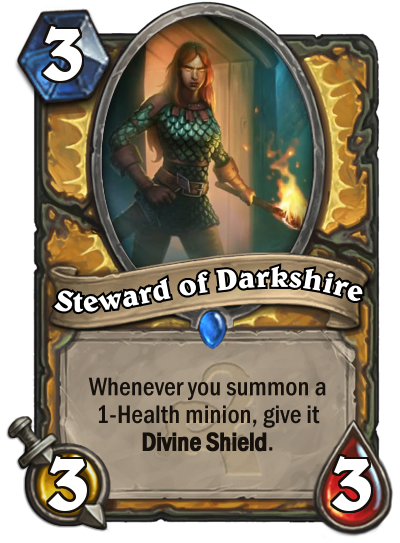 Steward of Darkshire may just change that, since its most obvious application is to create an aggressive Paladin Zoo deck, full of weak minions that get that extra boost of protection from the Divine Shield. Plus, it means cards like Stand Against Darkness, which we previously dismissed as a poor replacement for Muster for Battle, is actually pretty good. It also combines well with some already-revealed 1-health cards coming in the expansion. But, the good Steward has some other possibilities as well. You could give small minions Divine Shields and then use them all to fuel a big Blood Knight threat relatively early in the game. Or, you could segue from a turn-3 Steward to a turn-4 Twilight Drake to have a hearty dragon with a Divine Shield. Like Silver Hand Regent, this is a 3 mana 3/3 that requires a combo to be good, so if you put it down before its time it's bound to be targeted quickly. Deathrattle: Return this to your hand. This card was almost immediately met with sharp criticism from the community, and for somewhat good reason. A 2/2 weapon would generally be valued at a little less than two mana, so costing three times that much is quite a stretch. However, the Deathrattle is extremely powerful, based on how Hearthstone cards work. Minions with powerful Deathrattle effects can be silenced, but there's no way to get rid of a weapon with a Deathrattle effect. At best you can trigger it early by destroying your opponent's weapon, and in the case of Tentacles, that would just send it straight back into their hands. That makes it one of the only cards that's practically impervious, discounting edge-cases like burning the card thanks to a full hand. You can get rid of it temporarily, but it will always remain in your opponent's toolbox. That's the kind of card that can come very handy for a deck that's built to last well into fatigue, which Control Warrior is. 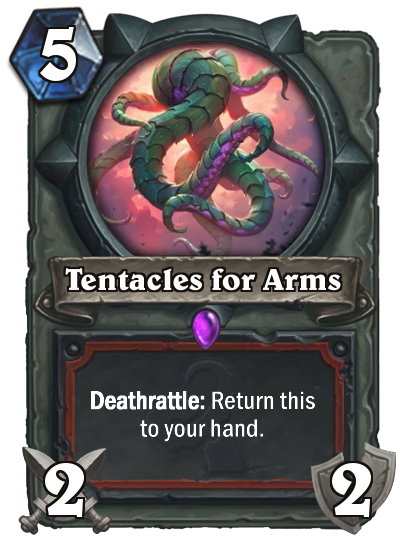 None of this necessarily makes Tentacles for Arms a good card, but it's conceivably useful in the right deck and with a slow enough meta-game. Whether that comes to pass will remain to be seen. When this attacks and kills a minion, gain +2/+2. This bad card has a ton of Old Gods flavor, so that's something, right? Let's look at the use-case for such a card. Attacking and killing a minion means that functionally, it will almost always lose some life in the process. Even if it attacks a 1-attack minion--a rarity by the time you could play it on turn eight--it will have lost one health and gained +2/+2. That gives you an 8/8 minion for 8 mana, which is fine vanilla stats, but you had to wait a turn to even make that much happen. That's all best-case scenario. More likely, this would be attacking into a minion with more competitive stats for the cost. Against any 8/8 minion, it dies immediately. Against the 6-mana Boulderfist Ogre, it trades evenly after two turns. When your eight-mana Legendary trades evenly with a 6-mana Basic, there's something very wrong. At best you could heal it up with a Priest, requiring a constant mana investment to keep it healthy, or give it Windfury with a Shaman so that it can trade two-for-one. But most 8-mana minions can trade two-for-one, without the extra investment required. Boogeymonster is just awful. The Paladin Hero Power can be pretty effective on its own, but your 1/1 recruits have no tribe to call their own. 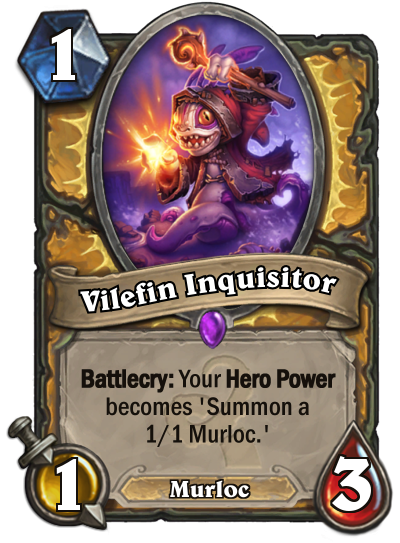 Vilefin Inquisitor fixes that by making them Murlocs, letting you use synergy with cards like Murloc Warleader and Tidecaller. That's a powerful effect if you build a deck around it, and it's paired with a card that has decent 1/3 stats for 1 mana. However, there are a few caveats to keep in mind. For one, this will discourage use of any cards that buff your Silver Hand Recruits, like Quartermaster (which is retiring from Standard anyway) or Warhorse Trainer. Plus, Justicar Trueheart only impacts basic hero powers, so you won't be able to use her to make your Hero Power spit out two murlocs at once. Traditionally, a Murloc-based Paladin deck revolves around Anyfin Can Happen as the win condition, summoning loads of murlocs that all boost your one Old Murk-Eye to be an extremely powerful combo finisher. But, Murk-Eye is considered a reward card, and so he won't be included in Standard once the new rules apply. Even in Wild, Vilefin Inquisitor wouldn't be good for an Anyfin combo deck, because it would run the risk of making your board full of fairly useless 1/1s. That means any deck that attempts to use Vilefin will have to be more based on regular tempo plays than big combos. It may work, but it will be a sea change from how Paladins use murlocs now. Battlecry and Deathrattle: Add a random Toxin card to your hand. Now we're talking. Xaril is the new Rogue Legendary, and most importantly, it's incredibly flexible. Though its 3/2 stats for 4 health is weak, the real strength is in the variety of random Toxin cards he can grant you. Each of these comes with an extremely powerful effect for only one mana, and you're guaranteed to get at least one. If he dies without being silenced, you get two. His Toxins can grant +3 attack, act as a Shadowstep, grant Stealth, deal two damage, or draw a card. Each of these would be a good value on their own, even if slightly undermined by the randomized nature of them. But in Rogue decks, cheap spells are even more valuable, since they can be used to activate Combo effects. 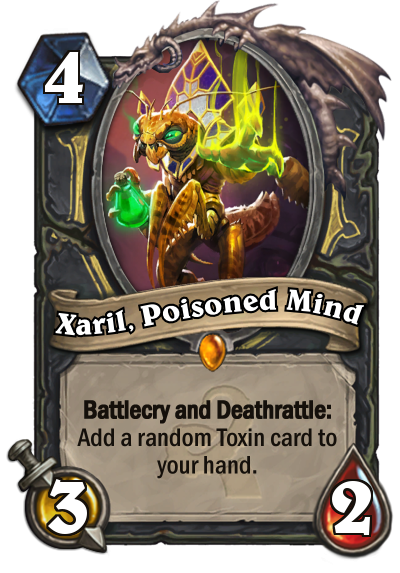 You could easily build a deck around getting a Cutpurse for an extra coin or two, Xaril to give you a Toxin card, then Shado-Pan Cavalry with a coined Toxin effect for good measure. That kind of value is hard to beat. 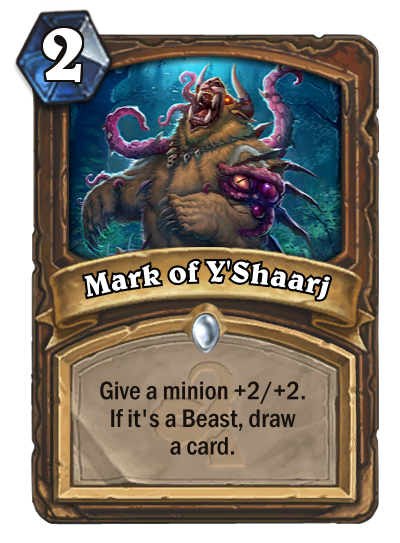 Y'Shaarj must be the Old God that the other Old Gods laugh at, because this card is bad. At 10 mana for 10/10 in stats, it passes the vanilla test just fine. Its effect means you'll get at least one instance of his effect, which essentially gives you a free minion on the board without the associated mana cost. If it happens to be a high-cost minion, that could potentially be a lot of value. However, compare this card with the Warrior Legendary card Varian Wrynn. Though it was praised as one of the strongest Legendaries of the set, it hasn't seen much play. In lengthy games--like the type that would even allow for a 10-mana minion--drawing from your deck can become a liability. It forces you to randomly miss out on Battlecries you may have needed. 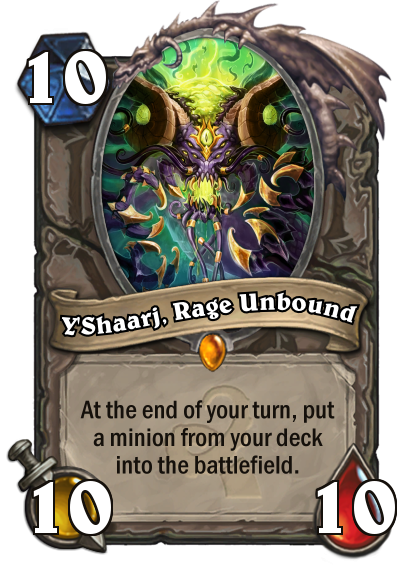 And Y'Shaarj only plays one card per turn, not up to three all at once like Varian. It has an extra 3/3 of stats, but with cards like Big Game Hunter in circulation the two are functionally identical. So we're left with a worse version of a card that doesn't see play in the first place. Ouch.